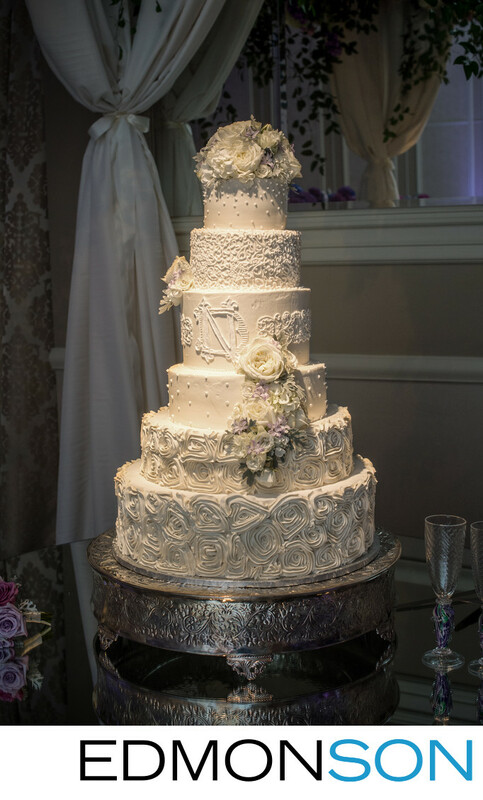 For traditional or classic wedding cakes that taste great and look even better, check out the Dallas Affaires Cake Company for your upcoming wedding. This 6 tiered masterpiece displayed inside the Adolphus Hotel Grand Ballroom uses soft white floral arrangements to provide a sense of elegace. Surrounding the brides cake is a canopy of flowers created by Jackson Durham to frame showcase the impressive artistry of Margarett Gragg and the rest of the DACC team. Dallas Affaires is located at 2307 Abrams Road, Dallas, TX 75214. Their phone number to make an appointment for your wedding consultation is 214-826-9409. 1/200; f/6.3; ISO 1250; 50.0 mm.